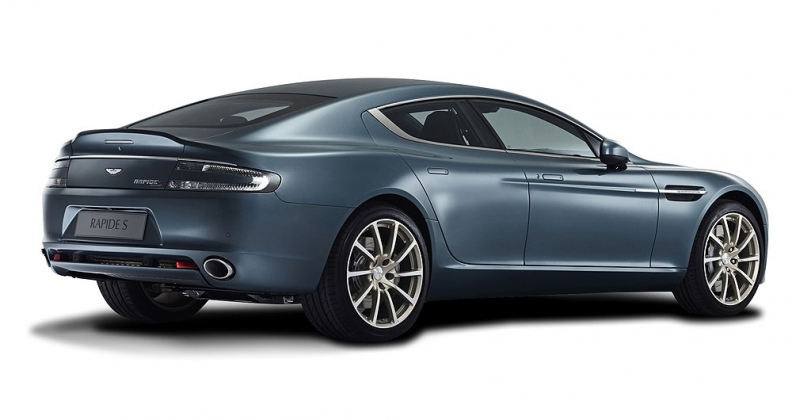 The electric car would be based on the Aston Martin Rapide S.
FRANKFURT (Bloomberg) -- Aston Martin plans to team up with Chinese consumer electronics group LeEco to help bring its electric RapidE vehicle to market by 2018. LeEco intends to provide the powertrain and battery pack for the vehicle to be built at Aston Martin's factory in Gaydon, England, the companies said in Frankfurt on Wednesday. The planned joint venture secures financing to take the battery-powered version of the current Rapide sports car from concept to production. "It brings Aston Martin's electric car project forward," Aston Martin CEO Andy Palmer said. The partners plan to develop an electric car based on Aston Martin's Rapide S. Financial terms of the transaction were not disclosed. Sports-car makers are increasingly being lured into the electric-car market, drawn by Tesla Motors' emergence and tightening environmental regulations. BMW sells the plug-in hybrid i8, and Porsche introduced the sleek Mission E concept car last year. While electric motors offer the promise of rapid acceleration, they lack the bone-tingling sound of traditional combustion-powered sports cars. "The sound of an Aston Martin is very graceful, that's kind of what gives its soul," said Will Farquhar, Aston Martin's strategy chief. "So we are looking at how we can create that soul in an electric vehicle." The all-electric sports sedan is part of the brand's push to more than double annual sales to above a former peak of about 7,500 vehicles, from 3,500 last year, Farquhar said. Aston also plans to build an electric version of its upcoming DBX crossover it’s not yet clear whether the DBX EV would use the same (or similar) powertrain as the RapidE. The British marque is seeking to generate its first net profit since 2010 in two years. It has said it plans to roll out a new model or variant every eight to nine months. Lei Ding, co-founder of LeEco's auto division, said: "The joint venture is a partnership platform. We can develop future electric vehicles for both parties." LeEco offers branded content via the Internet, television set top boxes and smartphones and hopes to use its captive audience and celebrity endorsements to promote cars in future. "In China we have around 300 million people who visit our website. We could advertise the Aston Martin for free. And we can use celebrities to promote our vehicle. This is the way we do business," Ding said. He previously held senior positions at joint ventures of Volkswagen and General Motors in China. Separately, the new joint venture plans to collaborate with Faraday Future, the start-up electric car firm backed by Chinese billionaire Jia Yueting. The electric car development platform by Aston and LeEco could also be used by Faraday, the companies said. "Aston can offer expertise in ride, handling refinement and those sorts of things," Palmer said. China's government is promoting electric vehicles to cut the smog that frequently envelops cities, which officials say has helped sales quadruple last year and has turned it into the world's biggest market. An electric car joint venture of Taiwan's Hon Hai, China's Tencent and China Harmony Auto Holding said this month it was hiring former BMW executive Carsten Breitfeld to lead it. Harmony Futeng, launched last March, is one of several Chinese tech companies trying to develop "smart" and electric vehicles. These include Alibaba, Baidu and Leshi Internet Information and Technology Corp Beijing, recently rebranded as LeEco.